We're live at the Institute of Culinary Education in New York with Icelandic Provisions and Feedfeed making some amazing recipes using skyr! It's not always easy to find ways to eat healthier alternatives to the everyday foods we eat. Well skyr (skee-er) is here to save the day. If you've never heard of it before, skyr is a yogurt-like Icelandic food that was originally founded by the vikings many, many years ago. The company Icelandic Provisions has made the product, the only traditional Icelandic skyr, available for purchase in grocery stores around the U.S.
We had the pleasure of using The Institute of Culinary Education's (I.C.E.) kitchen and teamed up with The Feed Feed, one of the largest and fastest growing social media communities of people who love to cook, and Icelandic Provisions to show people how easy it can be to incorporate skyr into your everyday recipes for easy-to-prepare, healthy alternatives. See all of the recipes in the video above, and check out the breakdown below for all of the details! Add skyr, banana, frozen berries and muesli or oats to a high-powered blender and process until smooth. Add a bit of water to help the mix blend, if needed. 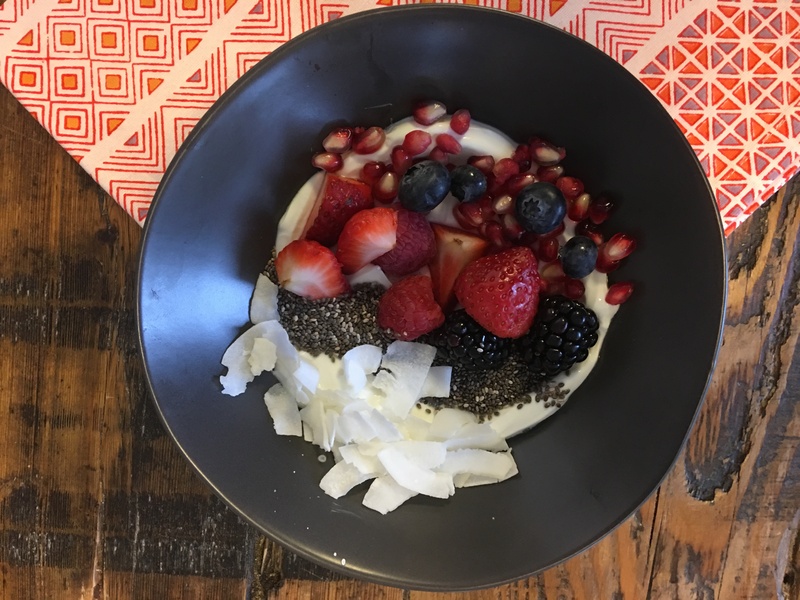 Pour into a bowl and top with fresh berries, chia seeds and coconut flakes. Toast the bread, then spread on the plain skyr. Season to taste with salt and pepper. 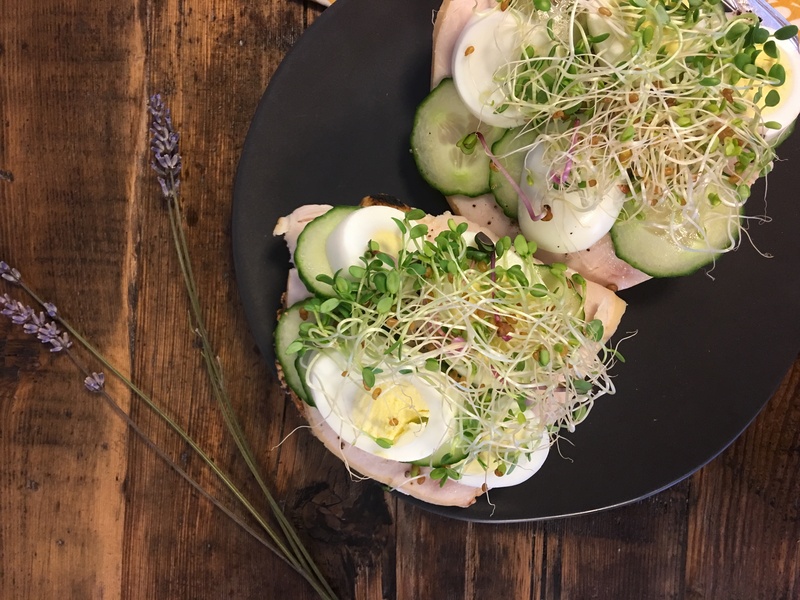 Top with turkey, egg and cucumber. Season once more with salt and pepper (if desired) then top with sprouts (if using) and enjoy! Add garlic and lemon juice to a small bowl and let sit for about 10 minutes to mellow the sharpness. Combine all ingredients in a bowl and stir to combine. Chill for about an hour before serving to let flavors come together. Serve with pita chips or crudite, or use an a sandwich spread. Preheat oven to 400˚F and line a baking sheet with foil. Combine the lemon zest, juice, chopped parsley, ½ of the minced garlic and 1 tbsp of olive oil in a small bowl and whisk to combine. Spread this mixture evenly over the two salmon filets, then season both sides generously with salt and pepper. Set the salmon skin side down on the baking sheet and bake for about 15 minutes, or a few minutes longer if you like your salmon cooked all the way through. Meanwhile, bring a medium pot of salted of water to a boil. Prepare an ice bath and set a fine mesh strainer inside of it. When water comes to a boil, add green beans and cook until bright green (about 2 minutes). Remove from water and add to strainer set over ice bath using kitchen tongs. Let beans sit for about 2 minutes, or until they have cooled completely, then remove from ice bath and let drain. Heat a large sauce pan over medium heat and add the remaining olive oil and garlic. Cook garlic for about 30 seconds, or until garlic becomes fragrant. Add the green beans and saute for about 3-4 minutes. Season with salt and pepper. 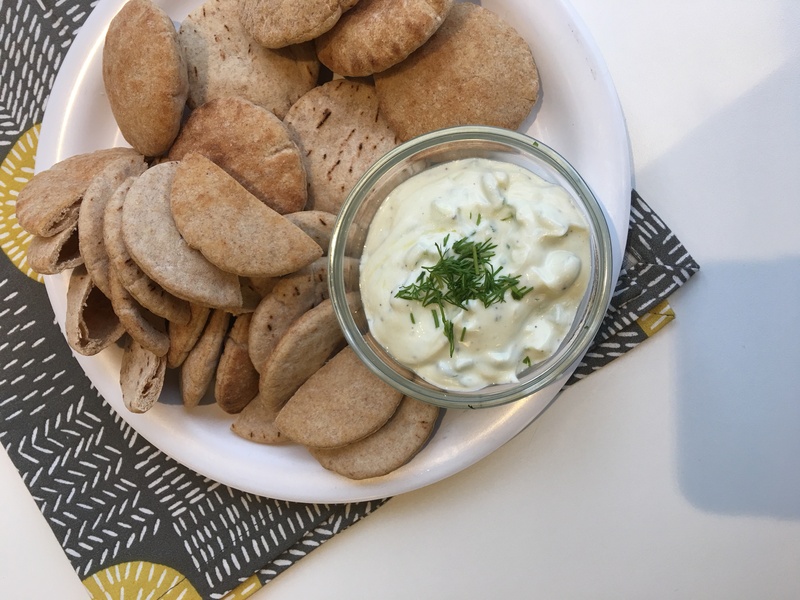 To make the skyr dill sauce, whisk all of the ingredients together, adding more salt and pepper to taste. To serve, divide the green beans between two plates and top with baked salmon. 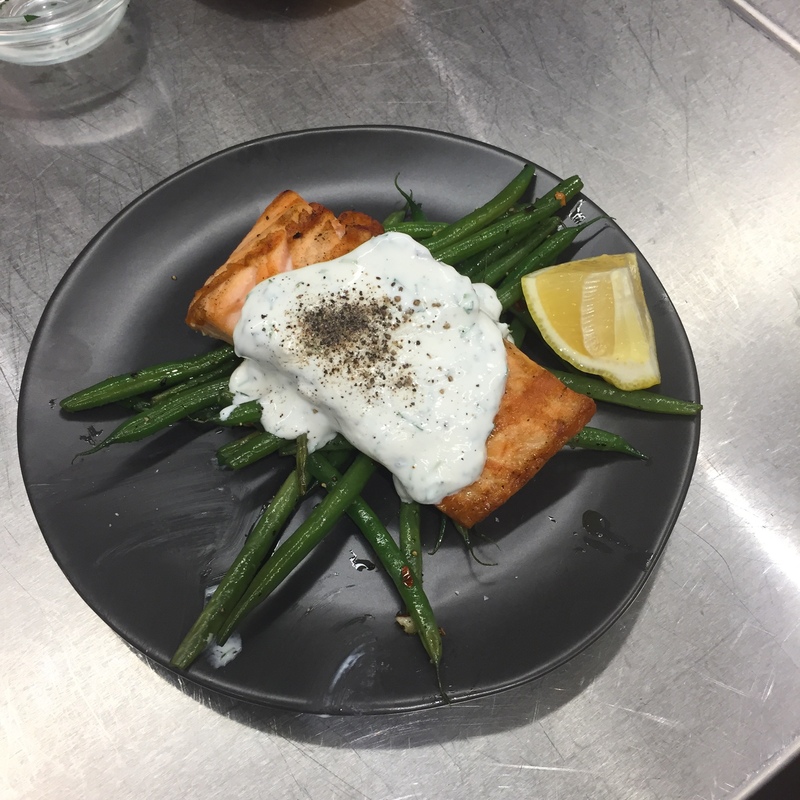 Drizzle the salmon with herbed skyr sauce and enjoy!